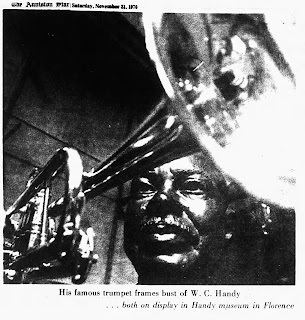 FLORENCE, AL -- Sixty-one years ago in a small honky tonk known as Pee Wee's Place in Memphis, William Christopher Handy put his trumpet to his lips and blew in a new era of music, a type of music that was to influence compositions for generations. On Sunday Florence will honor W. C. Handy for his contributions to the world of blues music. More than 40 of the top names in the blues and jazz fields will gather Sunday night for a concert in memory of the man that made the blues a part of the musical world. 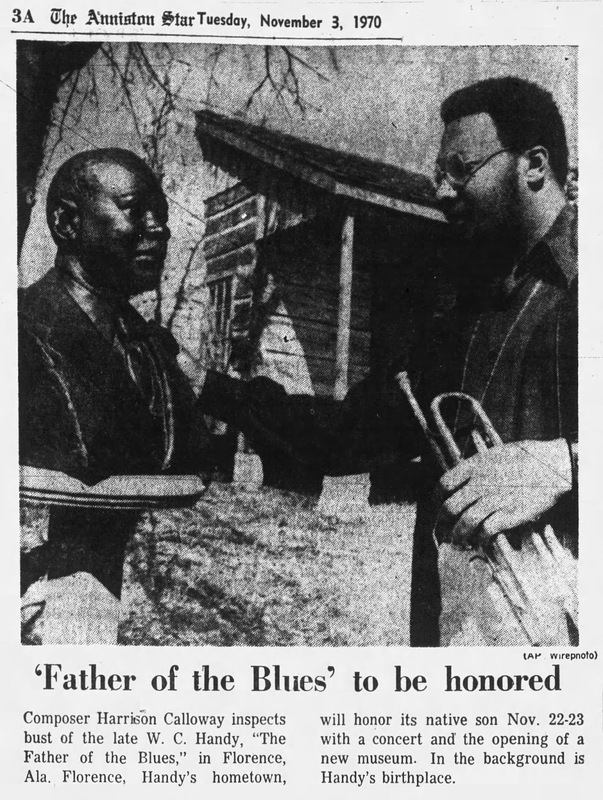 Handy, whose "Memphis Blues” and "St. Louis Blues” became the standards of a new musical era, always reminded interviewers that he was from Florence and his family insisted after his death in 1958 that his personal effects and musical collections go to that city. Handy, band director at Alabama A&M College in Huntsville, continued his musical interests up to his final years although he was blind for the latter portion of his life. On display in the Handy Museum in Florence will be a Braille dictionary he used. The museum will open Monday and will feature the famed trumpet that Handy used from 1920 on. Also on display will be the original scores of his compositions, and the many letters. plaques and written tributes that he received during his career. 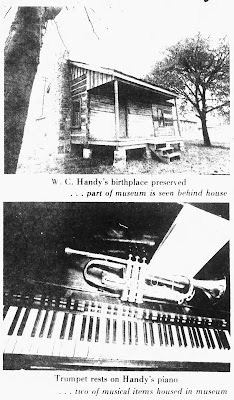 Handy's home, a small two-room log cabin, has been moved several blocks from where he was born and a large room added at the rear to provide for the many items the Handy family has given to the museum. The Florence Chamber of Commerce hopes to make the blues concert an annual affair. Handy's widow, brother, sister, daughter and two sons will attend the concert and museum opening. 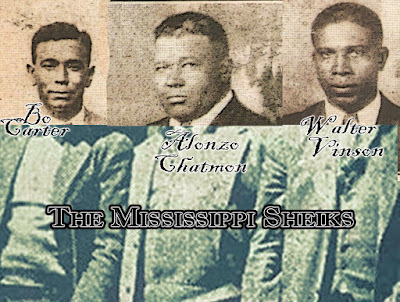 Performing at the concert at the Florence State University Fine Arts Auditorium will be the Olympia March Band of New Orleans, the Ronnie Cole Trio, Blanche Thomas, who has been singing for nearly a half century, Lou Sino and the Bengals, Danny Baker and possibly Pete Fountain or Al Hurt. Jimmy Odum, of the Florence Chamber of Commerce, said that the movie about Handy’s life will be shown at a Florence Theatre during the two days of activities. The late Nat King Cole played Handy in the movie. Handy was fond of his hometown and often came back to visit. On one such visit, V-E Day he stood outside the Florence Times and played God Bless America. But the Father of the Blues--later said those days of misery contributed to the making of the St. Louis Blues. I like in think that song reflects a life filled with hard times as well as good times.